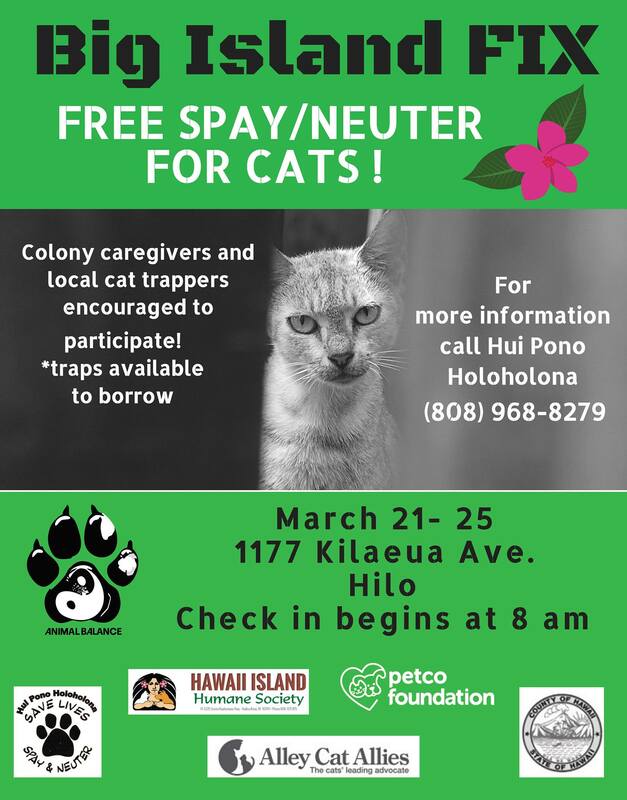 Hui Pono Holoholona is seeking volunteers on Thursday, March 8, 2018, at the Eagles Lodge from 9 a.m. to 3 p.m. to help with preparations for the upcoming Animal Balance Mash Clinic happening Wednesday through Sunday, March 21 through 25, 2018, in Hilo. The intent of the clinic is to spay and/or neuter 500 to 700 cats for free. On Thursday, March 8, volunteers will be cutting and folding surgical drapes, cutting sheets to cover humane traps, and much more. The Hui is also volunteers to please donate towels and sheets. Volunteers can help out for an hour or two or all day, however they are asked to bring their own lunch. To find out more information, call (808) 769-1128 or go online. The Eagles Lodge is located across from Kea’au Humane Society on Highway 130. To find out more about the Animal Balance Program, click here.